Between the commencement of hostilities in August, 1914 and the Armistice in November, 1918 some 78 Initiates and Joining Members are entered in the Register. The majority, as you may be expected, were members of the Royal Marines and other arms of the services stationed at the Barracks in Walmer. The Golden Jubilee was celebrated in 1916 and a Jewel was struck. Little’s Cafe, Queens Street, Deal (12/2/1941 to 19/5/1942) Little’s Cafe was destroyed by enemy action in August, 1942 and both the Charter or Warrent and Banner of the Lodge were very badly damaged. The Warrent was skilfully repaired and a new Banner was obtained in 1956. The Old Manor House, Upper Deal, (21/10/1942 to 24/01/1945). The Installation meetings of the 15/4/43 and 20/4/44 were held in the St Leonard’s Parish Hall, Upper Deal. From 1943 to 1945 the Lodge united with the Wellington Lodge No 784, when meetings were held under joint banners of the two Lodges, until the Masonic Hall again became available on the 20th February 1945 and the Lodge returned to work in the Temple on 27th February. 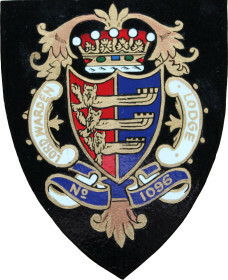 The Lodge of Instruction was held quite regularly at the home of WBro G E Goslett P.G. Std Br., P.P.S.G.D., The Windsor Castle Inn, 6 High Street Deal.